Matthew Apgar - mapgar@shawmedia.com Capt. 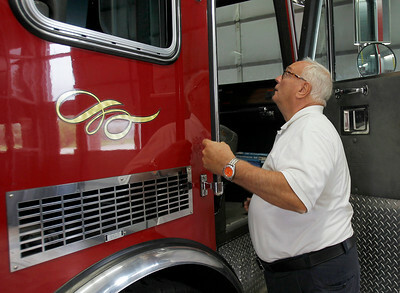 Kevin Eriksen looks up into the cab of a fire engine at the Cary Fire Station 1 on Friday, June 5, 2015 in Cary. Eriksen has been with the fire department for 34 years and will be retiring on Sunday. Matthew Apgar - mapgar@shawmedia.com Capt. 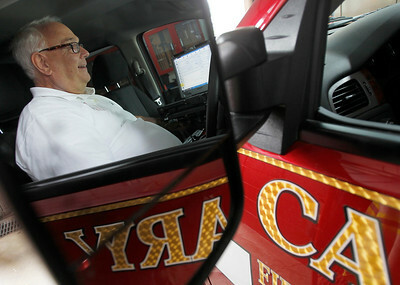 Kevin Eriksen is reflected in the side mirror of a vehicle at the Cary Fire Station 1 on Friday, June 5, 2015 in Cary. Eriksen has been with the fire department for 34 years and will be retiring on Sunday. Matthew Apgar - mapgar@shawmedia.com Capt. Kevin Eriksen plugs a vehicle into the station's charging station at the Cary Fire Station 1 on Friday, June 5, 2015 in Cary. Eriksen has been with the fire department for 34 years and will be retiring on Sunday. Capt. Kevin Eriksen plugs a vehicle into the station's charging station at the Cary Fire Station 1 on Friday, June 5, 2015 in Cary. Eriksen has been with the fire department for 34 years and will be retiring on Sunday.